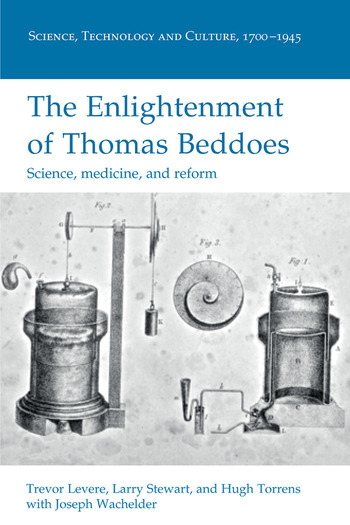 Thomas Beddoes (1760-1808) lived in ‘decidedly interesting times’ in which established orders in politics and science were challenged by revolutionary new ideas. Enthusiastically participating in the heady atmosphere of Enlightenment debate, Beddoes' career suffered from his radical views on politics and science. Denied a professorship at Oxford, he set up a medical practice in Bristol in 1793. Six years later - with support from a range of leading industrialists and scientists including the Wedgwoods, Erasmus Darwin, James Watt, James Keir and others associated with the Lunar Society - he established a Pneumatic Institution for investigating the therapeutic effects of breathing different kinds of ‘air’ on a wide spectrum of diseases. The treatment of the poor, gratis, was an important part of the Pneumatic Institution and Beddoes, who had long concerned himself with their moral and material well-being, published numerous pamphlets and small books about their education, wretched material circumstances, proper nutrition, and the importance of affordable medical facilities. Beddoes’ democratic political concerns reinforced his belief that chemistry and medicine should co-operate to ameliorate the conditions of the poor. But those concerns also polarized the medical profession and the wider community of academic chemists and physicians, many of whom became mistrustful of Beddoes’ projects due to his radical politics. Highlighting the breadth of Beddoes’ concerns in politics, chemistry, medicine, geology, and education (including the use of toys and models), this book reveals how his reforming and radical zeal were exemplified in every aspect of his public and professional life, and made for a remarkably coherent program of change. He was frequently a contrarian, but not without cause, as becomes apparent once he is viewed in the round, as part of the response to the politics and social pressures of the late Enlightenment. Trevor Levere is University Professor Emeritus in the Institute for the History and Philosophy of Science and Technology, University of Toronto, Canada. Larry Stewart is a Professor in the Department of History, University of Saskatchewan, Canada. Hugh S. Torrens is Emeritus Professor of History of Science and Technology at Keele University, UK. Joseph Wachelder is an Associate Professor in the Department of History, Maastricht University, the Netherlands.